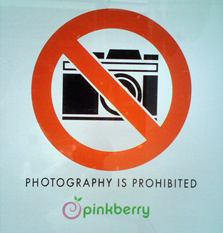 Can't imagine why they'd pick on camera's (instead of, say, accessory dogs) with this sign in the window of Pinkberry at Century City shopping mall. But, the message is clear. Who knew it had become such a problem for them?